Comparative politics should be a central, if not the central, concern of political science. For most research in the discipline there is little or no opportunity for experimentation — citizens are not likely to submit to very much experimentation on matters as crucial as the selection and management of their governments. Even were more experimentation possible for political situations, it is not at all clear that the results would be as beneficial for comparative political research as they might be for other parts of the discipline. Comparative scholars generally can be more productive when attempting to understand political behaviour within its natural context than when trying to analyse it in the artificial settings characteristic of social experimentation. This assumes that, contrary to Przeworski and Teune’s (1970) ideas about most different systems designs, there are structural properties of systems that are important for explanation. Occasionally, governments do conduct what are in essence natural experiments, for example New Zealand and Japan changing their systems of voting, but those opportunities for testing theory are extremely rare. 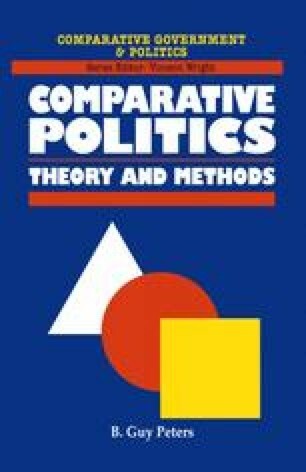 Given the importance of comparative analysis for the development of empirical political theory, this book has focused on the numerous dangers to valid comparative research, and on the ways in which the analysis can be improved.